Max Verstappen and Daniel Ricciardo make up the most exciting line-up in Formula 1 and ahead of the new season the pair will look to disrupt the recent status quo, which in turn could end up saving the sport. To say the top table at Formula 1 is a closed shop would be one hell of an understatement. In the 79 races over the previous four seasons just three teams could claim a race victory. Lewis Hamilton’s astonishingly dominant Mercedes lead the way with 63 wins, shared between the reigning world champion and his two steely team-mates past and present; Nico Rosberg and Valtteri Bottas. The remaining 16 races are split evenly between two very different teams. On one side, with years of history, prestige and success, sit Ferrari. The grand old figure of racing, with more constructors titles than anyone else and a record that can be traced back over 50 years. And sitting at the other end of the table are the upstarts - chewing gum and playing their music too loudly. Red Bull, powered by the energy drink giants and with a car built out of Milton Keynes do not have an illustrious past akin to their rivals from Germany and Italy. But they have something special. Two drivers who will do whatever it takes to win. Mercedes and Ferrari will both tell you that they are a team and act accordingly but ultimately they are geared towards fuelling the title aspirations of Hamilton and his arch-rival, Sebastian Vettel. The Finnish duo of Bottas and Kimi Raikkonnen are undeniably talented, but neither would be expected to make a proper push for crowning glory. By contrast Red Bull clearly have no preference. They just wind up their drivers, let them loose on a track every couple of weeks and watch the mayhem that ensues. 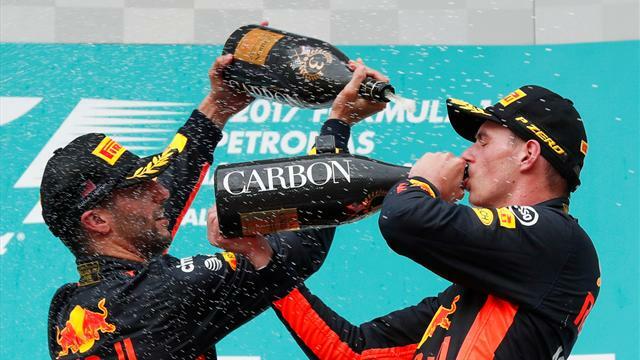 Fernando Alonso may be arguably the most gifted driver on the circuit, Hamilton the most impressive in his pursuit of victories, but Verstappen and Ricciardo are easily the most enjoyable, both on and off the track. Both drivers are unapologetically no holds barred, operating with the motto that if they cannot drive at 100% what is the point in getting into the car? First Ricciardo, the senior member of the duo, about to enter the fifth season with the team but coming into it after just two wins in the past three seasons. The Australian, who would love nothing more than a win in his home race in the season opener in Melbourne in Sunday, has always found a way to capture the imagination of fans. From his infamous ‘shooey’ celebration to performing on stage with rock band Parkway Drive, Ricciardo never takes himself too seriously, constantly giving off the impression of someone who is determined to enjoy every second he has on earth. With his boyish smile and evident charm, Ricciardo would be equally happy cruising with friends in Perth or hammering around Silverstone at 200mph. However he also has a steely determination that belies his cheerful exterior, perhaps not too surprising for a man who has had a honey badger on his helmet in the past. Explaining his choice of mascot Ricciardo said "It's supposed to be the most fearless animal in the animal kingdom.
" When you look at it, he seems quite cute and cuddly, but as soon as someone crosses his territory in a way he doesn't like, he turns into a bit of a savage and he'll go after anything – tigers, pythons – he turns very quickly, but he's a good guy." It is an animal that clearly speaks to Ricciardo, who has never been afraid of tangling with the biggest names in motorsport. He’s at his best when he’s cornered, as demonstrated by his simply incredible performance in Baku last year. Starting tenth on the grid Ricciardo produced a fearless display to power to the front, which included a triple over-take as he passed Nico Hulkenberg, Lance Stroll and Felipe Massa in one move. He recently told the Guardian “the intensity and the fight I have shown was always in me” when asked about wanting “to throw my helmet” at a fellow driver after he put him out. That particular driver who was public enemy No. 1 in the Australian’s eyes? None other than his team-mate, a certain Mr Verstappen. Verstappen is the youngest driver to ever start a Formula 1 race, aged 17 years and 166 days when he started on the grid at Melbourne in 2015. However age is not always an indicator of talent. Verstappen, though, has plenty more to showcase why is the most exciting driver in the grid. He is also the youngest person to ever score points in F1, which he achieved at Malaysia in just his second race ever. Still not convinced? Well about the fact that he is also the youngest to ever win a F1 race, aged just 18 years and 228 days when he triumphed in Spain in 2016. For reference the next youngest is Vettel when he triumphed at Italy in 2008. How old do you suppose Vettel, a man with four world titles, was? 19? 20? Guess again. The German was 21, nearly three years older than Verstappen was. Alonso and Hamilton had to wait until they turned 22 for their first win, Raikkonen and Michael Schumacher a year later still. Of course Verstappen needs more to live up to the hype but it’s imperative to remember he is still only 20. Whilst the other greats were still trying to cement their positions within the sport Verstappen is very much a contender for the title. You’d perhaps worry about the toll this could take on a young individual but Verstappen, a man who raced in F1 without being able to drive on the road, just takes it all in his stride. He told the Guardian that “I just enjoy it and drive as fast I can,” and like his team-mate it’s when conditions are worst that he seems to find that extra gear. His drive in the rain in Brazil in 2016 will live long in the memory and there are few better in the wet than the Dutchman. The pair are not afraid to challenge each other, as Budapest last year shows, but there is a genuine friendship there, built on a mutual respect. Some teams have characters, often tempered by a more serious colleague, but Red Bull have a special chemistry and that could save F1 as fans complain the sport is becoming more mundane, with a predictable title race and not as much action. And this year they may be able to go the extra mile, to back up their off the track antics with on-circuit success that extends beyond the odd thrilling victory. Last season, despite winning three races (one thanks to Ricciardo’s heroics in Baku and the other two courtesy of Verstappen unleashing all of his pent-up frustration towards the end of the season), the Red Bulls looked a step behind their rivals. Now woe betide he who makes predictions off testing but after Barcelona there are reasons to be optimistic. The car looks noticeably quicker and some observers left feeling that now they may be closer to Mercedes than Ferrari are. Red Bull have two drivers who are genuine box office. They never back off and they are supremely talented. They are beholden to no-one and will take the fight to Hamilton right to the line. As F1 looks to unlock the next generation it is a Ricciardo and Verstappen who hold the keys.